SUMMARY: We describe a rare case of a de novo cerebral arteriovenous malformation (AVM) in a 9-year-old girl. MR imaging at 6 years of age demonstrated band heterotopia. Follow-up MR imaging 3 years later demonstrated a new 3.5-cm AVM in the left parietol-occipital region, confirmed by conventional angiography. This report, along with limited previous reports, suggests that AVMs can be acquired lesions and that AVM development is a dynamic process extending into the postnatal period. An arteriovenous malformation (AVM) is a vascular malformation characterized by arterio-venous shunt through a collection of tortuous vessels without an intervening capillary bed.1 The pathogenesis of AVMs is currently unknown. Although they are traditionally thought to be congenital in origin, with an initiating event occurring in early embryologic development, some have suggested a more dynamic developmental process.2,3 We present a case of de novo AVM development in a region of the brain without abnormal vascularity on prior MR imaging and briefly review the literature on de novo AVM development and pathogenesis. A 6-year-old girl was evaluated with MR imaging because of seizures and developmental delay. Imaging demonstrated continuous band heterotopia (Fig 1A). No vascular abnormality or abnormal signal intensity was demonstrated. A, Axial T2-weighted MR imaging at 6 years of age demonstrates diffuse band heterotopia (arrowheads). Note the absence of enlarged vessels in the magnified segment. B, Axial T2-weighted image at the same level 3 years later demonstrates a new serpiginous grouping of signal-intensity voids in the left parieto-occipital region along the margin of the left lateral ventricle consistent with an AVM (arrow). Enlarged left middle cerebral artery feeding vessels are also noted (arrowheads). Three years later the patient presented with increased seizure activity, behavioral changes, increased ataxia, and aphasia after a minor head injury. CT demonstrated no evidence of a skull fracture or hemorrhage. MR imaging (Fig 1B) revealed a tangle of serpiginous flow voids along the margin of the left lateral ventricle at the junction of the left temporal and occipital lobes, consistent with an AVM. 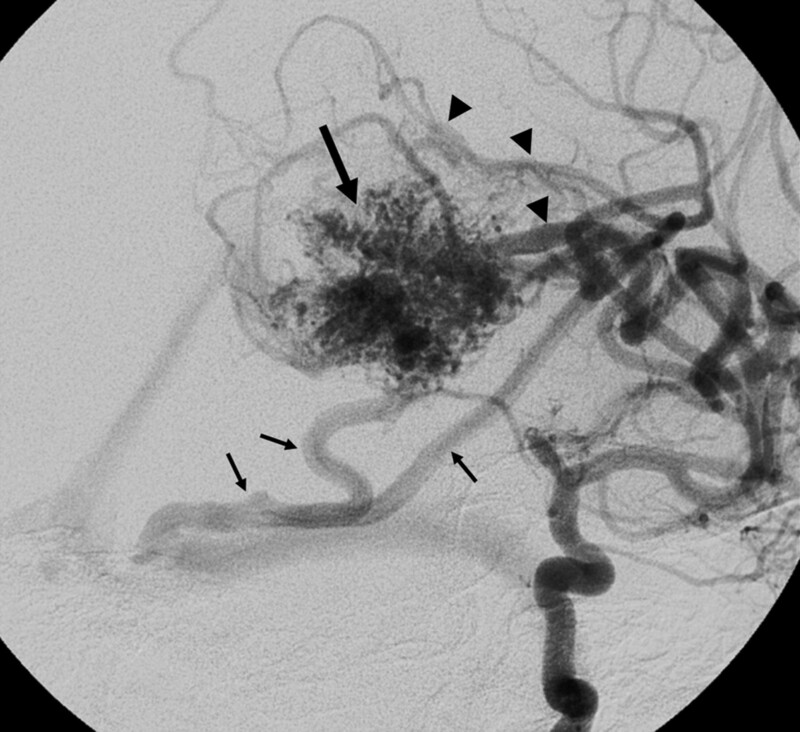 Cerebral conventional angiography (Fig 2) delineated a 3.5-cm AVM nidus with predominant arterial supply from distal branches of the left middle and posterior cerebral arteries. Venous drainage was through the ipsilateral thalamostriate veins and also through parenchymal veins extending into the left transverse sinus. The patient is currently undergoing radiation therapy for this lesion. Oblique projection of a left internal carotid angiogram shows a 3.5-cm left parieto- occipital AVM nidus (large arrow) supplied by parietal middle cerebral artery branches (arrowheads), with venous drainage primarily to the medial transverse sinus near the torcular (small arrows). Additional deep venous drainage is not as well seen on this projection. We present a rare example of de novo AVM formation in a child with abnormalities of neuronal migration. A literature review identified 5 previously reported cases of de novo AVM development. Three of these cases are of patients with pre-existing vascular pathology who developed AVMs in or near pathologically altered brain.4–6 Only 2 previous reports7,8 document a cerebral AVM arising in brain parenchyma shown to be without vascular pathology on prior MR imaging. To our knowledge, no previously reported case has documented a de novo cerebral AVM developing in a patient with a neuronal migrational disorder. Abnormalities of arterial21 venous,22 and microvascular23 structures have been described in relation to areas of abnormal neuronal migration. Abnormal vascular structures have been described in association with periventricular nodular heterotopia in filamin 1 gene mutation,23 suggesting 1 potential link between neuronal migrational disorders and vascular malformations. This case report demonstrates postnatal development of an arteriovenous malformation in a patient with extensive band heterotopia. This case and the few previous reports of de novo AVM challenge the concept that cerebral AVMs are purely congenital lesions. AVMs appear to be dynamic lesions that have the potential to develop and grow with time. It is possible that acquired insults can provide the catalyst for the formation of AVMs later in life, and as suggested by this case, disorders of neuronal migration may share common genetic ground with abnormalities of endothelial proliferation. Accepted after revision June 16, 2008.